Although one of the most serious consequences of the Zika virus (ZIKV) in infants is microcephaly, there is a broad collection of anomalies now known as congenital Zika syndrome (CZS). Some of the most serious are ophthalmologic, including macular scarring, retinal defects, low visual acuity, strabismus, and nystagmus. Two papers published in the Journal of the American Association for Pediatric Ophthalmology and Strabismus (AAPOS) evaluated visual function among infants with suspected and confirmed CZS. Both studies found that while about 40% of patients had ocular abnormalities, 100% of children tested had visual impairment. Thus, cortical visual impairment might be the most common cause of blindness among children with CZS. In a study conducted in Brazil, 70 infants with microcephaly were examined at CAVIVER, a nongovernmental organization clinic and referral center dedicated to visually disabled children in Fortaleza. A team of ophthalmologists, neurologists, geneticists, and pediatricians, led by Marcia B. Tartarella, MD, PhD, Department of Ophthalmology and Visual Science, Federal University of Sao Paulo, Sao Paulo, Brazil, evaluated the infants from January to May 2016. Twenty-five had ophthalmologic changes: 18 with intraocular abnormalities, including macular chorioretinal atrophy, mottled retinal pigment epithelium, and optic nerve pallor; seven with strabismus or nystagmus without intraocular abnormalities. Eleven infants who could be tested for visual acuity, were all below normal range. Investigators noted that although they could not obtain specific serological tests that would confirm ZIKV infection in these patients, all were screened for other infectious conditions that could cause microcephaly. Another study, which included 32 infants born in Pernambuco, Brazil from May to December 2015 with confirmed ZIKV infection, found visual impairment in all patients. Fourteen patients exhibited retinal and/or optic nerve damage and had neuroimaging or neurological abnormalities detected at birth. Twenty-six mothers reported symptoms or signs compatible with ZIKV infection during their pregnancies, 13 during the first trimester, 9 during the second, and 3 in the third. Twenty-six infants were born full-term while six were pre-term. Involvement of the retina can take several forms. 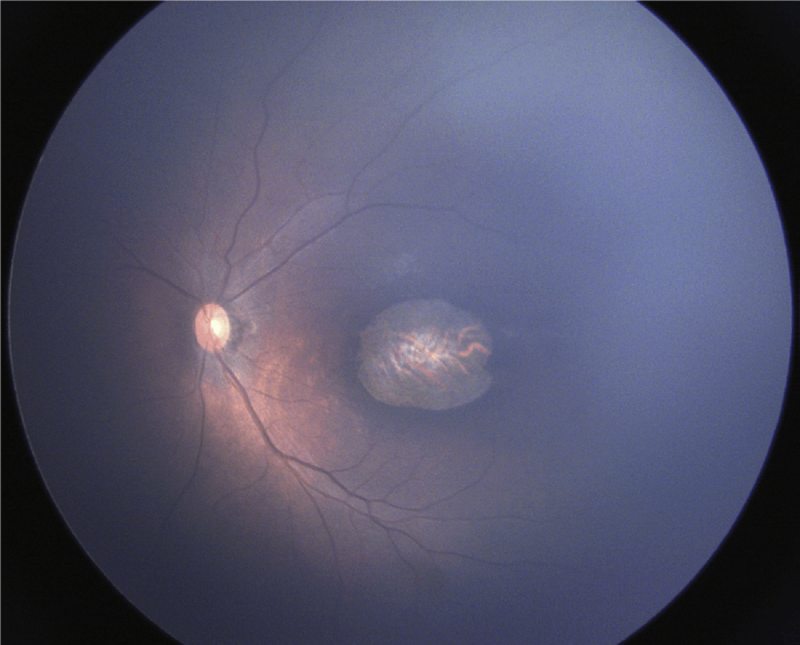 Wide-angle fundus image (RetCam) of the left eye of a child with congenital Zika syndrome showing large chorioretinal scar in the macular region. In an accompanying editorial, Sonja A. Rasmussen, MD, MS, and co-authors suggest that as our knowledge of the effects of Zika virus infection evolves, we can learn from the experience with rubella infection during pregnancy. Beginning with an astute observation in 1941 by ophthalmologist Norman Gregg, followed by descriptions of a wide array of manifestations, the full effects of congenital rubella infection became understood. “The visual system in infants with microcephaly related to presumed congenital Zika syndrome,” by Islane Verçosa, MD, Paula Carneiro, MD, Reno Verçosa, MD, Renata Girão, MD, Erlane M. Ribeiro, MD, PhD, Andre Pessoa, MD, Nadia G. Almeida, MD, PhD, Paloma Verçosa, MD, and Marcia B. Tartarella, MD, PhD (http://dx.doi.org/10.1016/j.jaapos.2017.05.024). “Visual impairment in children with congenital Zika syndrome,” by Liana O. Ventura, MD, PhD, Camila V. Ventura, MD, Linda Lawrence, MD, Vanessa van der Linden, MD, Msc, Ana van der Linden, MD, Adriana L. Gois, MD, Milena M. Cavalcanti, MD, Eveline A. Barros, MD, Natalia C. Dias, MD, Audina M. Berrocal, MD, and Marilyn T. Miller, MD (http://dx.doi.org/10.1016/j.jaapos.2017.04.003). Editorial: “The eyes as a window to improved understanding of the prenatal effects of Zika virus infection,” by S. Grace Prakalapakorn, MD, MPH, Dana Meaney-Delman, MD, MPH, Margaret A. Honein, PhD, MPH, and Sonja A. Rasmussen, MD, MS (http://dx.doi.org/10.1016/j.jaapos.2017.07.001). They appear in the Journal of AAPOS, Volume 21, Issue 4 (August 2017) published by Elsevier. Full text of these articles is available to credentialed journalists upon request; contact Eileen Leahy at +1 732-238-3628 or hmsmedia@elsevier.com to obtain copies. Journalists wishing to interview the authors should contact Marcia B. Tartarella, MD, PhD, at +55 11 982558725 or tartarella@yahoo.com; Linda Lawrence, MD, at lmlawrencemd@gmail.com; and Sonja A. Rasmussen, MD, MS, at media@cdc.gov.